Atopic dermatitis is a chronic relapsing dermatosis characterized by chronic itching and dry skin. It is caused by genetic predisposition. Clinical features of the disease depend on the age it first occurs. It usually occurs in early childhood. The prevalence is estimated at 15-17% of preschool and school age children. The incidence in adults is lower and ranges between 1% and 3%. Available data indicates that this disease affects more than 20% of Europe’s population and it affects the quality of life for patients. The incidence of atopic dermatitis has increased 3-4 times in the last 30 years. Atopic dermatitis usually starts between the first 3 to 6 months, and in half of the patients the disease starts by the end of the first year of age. In most patients, the symptoms subside by puberty, but a number of patients have symptoms for life. A significant correlation of this disease with allergic rhinitis and asthma is noted. In patients with atopic dermatitis, there is a greater likelihood of developing allergic rhinitis or asthma later in life than in healthy individuals. The onset is not fully determined. The influence of genetic factors is unquestionable (inheritance). Children of parents suffering from this disease are at high risk of developing atopic dermatitis (60% of children develop atopic dermatitis if one parent has it, and 80% of the children develop it if both parents have it). Environmental allergens play a key role in this (inhaled and nutritional), as well as the damaged skin barrier and the immune response of patients. Most patients (up to 84%) have elevated IgE values, which suggests an allergic basis of this disease. Only a small proportion of patients have elevated levels of IgE and allergens in them do not play a significant role in the manifestation and exacerbation of disease. Allergens can be nutritive (found in foods) and inhaled (inhaled with air). The most common allergens which provoke the immune response are: house dust, feathers, eggs, cow’s milk, wheat flour, peanuts, soy, fish. Typical symptoms of atopic dermatitis are: dry skin, itching and eczema (dry scaly skin rash that can go into small blisters, scabs or skin thickening). Depending on the patient’s age, typical changes are present in different parts of the body. In infants, skin changes occur on the cheeks, forehead, scalp, upper body, hands and feet. In children at the age of 2 to 3, typical changes are present in the folds of large joints (elbows, knees, neck, wrist and ankles). In older patients, the changes persist in the folds, on the eyelids, hands and feet. A common symptom in all age groups is the presence of intense itching, which impairs the quality of life and often disturbs the patient’s sleep. The disease is chronic in nature with alternating periods of improvement and worsening of clinical symptoms and skin changes. Treatment of atopic dermatitis is symptomatic and the main goal is to prevent the occurrence of dry skin, relieve itching and hives, in order to control and prevent complications such as skin infections. Treatment includes proper skin care using only pH-neutral soap and moisturisers, because the skin is extremely dry if affected by this disease. It is also necessary to avoid all irritating factors that can lead to worsening of the disease. Irritating factors are rather specific, therefore it is necessary to individually determine the irritants that aggravate the disease for each patient. Some of the most common irritants are wool clothing, cold weather, emotional stress, staying in an overheated room, use of unsuitable cosmetics, detergents, etc. In most patients, allergens can play a significant role in the manifestation and exacerbation of the disease. If allergens that aggravate (exacerbate) the disease are known, it is necessary to avoid them. The most commonly used drugs are topical corticosteroids. They have an anti-inflammatory effect and relieve itching. The corticosteroid treatment is carried out over several weeks under medical supervision. Despite the good effect on all symptoms of atopic dermatitis, they should not be used continuously over time, because prolonged usage can lead to adverse effects (skin thinning or atrophy and enlargement of blood vessels or telangiectasia). Anti-allergy medication (antihistamines) are also used because they have a positive effect on reducing itching. The sedative (narcotic) effect of these drugs is also helpful, since they improve the patients sleep when taken at night. More recently, the so-called topical immunomodulators (tacrolimus and pimecrolimus) are used for the treatment of atopic dermatitis. These drugs are applied locally and, unlike corticosteroids, do not have an adverse effect on the skin (no occurrence of atrophy and telangiectasia). Because of possible systemic side effects, they are used only as recommended by a specialist, for treating moderate to severe forms of atopic dermatitis. The coastal climate and swimming in the sea are beneficial for people with atopic dermatitis, although prolonged exposure to sunlight should be avoided. Pantexol Repair is a medical product that contains ectoin®, a natural molecule that protects cells with its properties for alleviating inflammation and stabilizing membranes. It reduces inflammatory processes, helps in the recovery process of the skin and soothes irritated and damaged skin. It protects the skin's immune system and prevents ageing and skin damage that can arise from exposure to UVA rays. It does not contain colours, scents, preservatives and emulsifiers, and is suitable for infants and children. 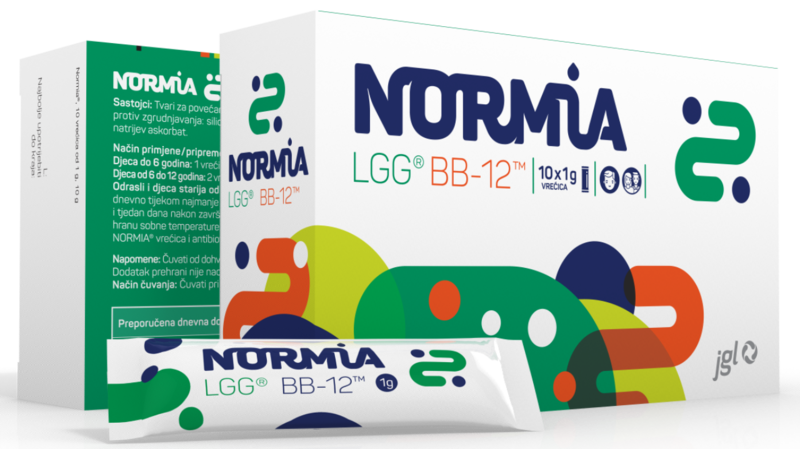 Normia contains specially selected bacterial cultures Lactobacillus rhamnosus, GG® and Bifidobacterium, BB-12™ in the amount of minimally 10⁹ live bacteria capable of reproduction. LGG® and BB-12™ are among the best researched strains, especially so in the case of children and pregnant women. Recommended intake duration is 2 weeks minimum. When used simultaneously with an antibiotic treatment, Normia and the antibiotic should be taken at least 3 hours apart.